Many Brachiaria species, including Brachiaria mutica, have been placed by some authors in the Urochloa genus, so the taxon Urochloa mutica (Forssk.) R.D. Webster ex Zon is often considered as the correct one. However, these changes remain disputed and many recent papers still refer to Brachiaria mutica (Torres González et al., 2005). Para grass (Brachiaria mutica (Forssk.) Stapf) is a semi-aquatic, palatable and good quality forage grass particularly suited to poorly drained, swampy and flooded tropical and subtropical areas. 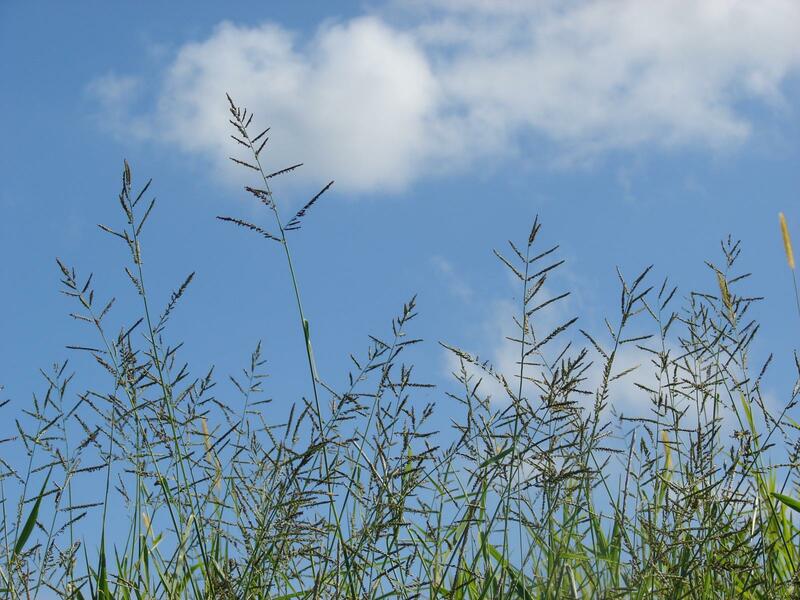 Para grass can be grazed, used in cut-and-carry systems or made into hay or silage. It can be used for erosion control on river banks and steep slopes (FAO, 2017; Lansdown et al., 2013; Cook et al., 2005). Para grass is a perennial, stoloniferous grass. It has stout and long trailing runners that can grow to a length of 5 m in one season (Cook et al., 2005). Erect culms are decumbent. They root from the basal nodes and may reach a height of 0.9-2 (-3) m. Para grass is leafy. Leaf blades are hairy, linear, up to 30 cm long and 16-20 mm wide. 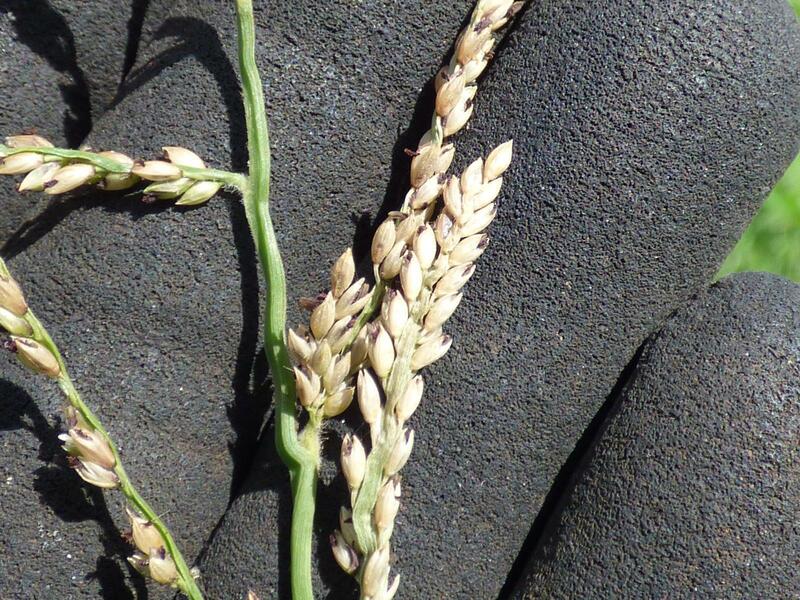 The inflorescence is a panicle (6)-10-20 (-30) cm long holding 5-20 spreading racemes (2-15 cm long) (Cook et al., 2005). In spite of its high number of flower heads, para grass is a poor seed producer and its seeds are not very viable (Lansdown et al., 2013). Para grass is a palatable species mainly used for its high quality forage. 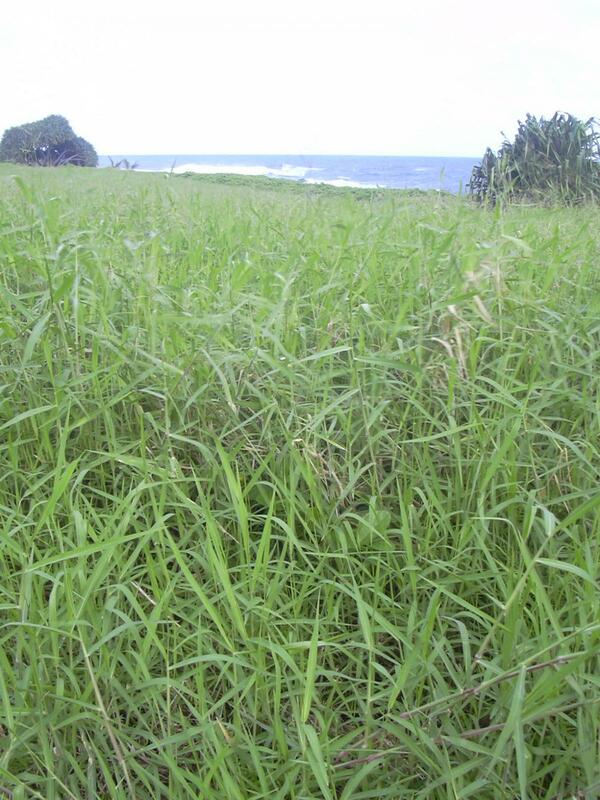 A fast growing grass, it can be grazed or used in cut-and-carry systems, either to be directly fed or to make hay or silage. It is particularly suited to wet, poorly drained places as it can grow in water down to 1.2 m deep (Lansdown et al., 2013). In such "pond pastures", para grass is a valuable green reserve of forage during droughts (Cook et al., 2005). It was reported to have ethnomedicinal properties, and its leaves are occasionally used as an antiseptic in cutaneous affections (Lansdown et al., 2013). In Brazil, para grass naturally hybridized with Brachiaria arrecta resulting in the hybrid "Tangola", a valuable grazing forage for milk production (Queiroz et al., 2012). Brachiaria mutica originated from Sub-Saharan flood plains and later spread southward to Central and East Africa. It was introduced as a forage grass or for erosion control into most tropical countries. It is naturally found in poorly drained, swampy or seasonally waterlogged areas, along creeks, rivers, floodplains, wetlands and drainage channels, around lakes and dams, in roadside ditches and in other damp habitats (Hannan-Jones et al., 2012; Cook et al., 2005; Holm, 1977). It can be found in the tropics up to 27°S. It grows from sea level up to an altitude of 1000 m (FAO, 2017). Para grass is a fast growing summer season species. Its most important trait is its semi-aquatic habit. It can grow in flooded conditions: its hairy leaves and hollow stems float over water depths of 0.3 m to 1.2 m depending on water temperature (deeper in warmer water). However, its roots do not stand continuous submersion. Para grass can grow in moist soils of humid and sub-humid areas with annual rainfall of 1200-4000 mm, or in swampy areas of drier environments down to 900 mm rainfall (Cook et al., 2005). It can survive short drought periods (Guenni et al., 2002). Para grass is a warm climate grass that grows effectively at temperatures around 22°C and stops growing under 15°C. It is damaged by frost but not killed. Though para grass prefers alluvial and hydromorphic soils, it does well on a wide range of soils: from sands to clays with moderate to good fertility (Rao et al., 2010; Cook et al., 2005). Para grass is both suited to poorly drained swampy areas and well drained moist soils. Para grass does well on acidic soils (pH 4,5) or containing high contents of trace elements. It has moderate tolerance to soil salinity (Cook et al., 2005). It can grow on alkaline reclaimed soils (Rao et al., 2010). Para grass is a full sunlight grass but tolerates partial shading: it can grow under mature coconuts in the Philippines, but is then susceptible to weeds (Cook et al., 2005). Para grass survives fires (see Environmental impact below) (Cook et al., 2005). Para grass is a productive plant, usually yielding 5-12 t DM/ha/year. It responds to N and P fertilizers. A fertilized stand could yield up to 30 t DM/ha in Queensland, Australia. In the Philippines, it was possible to obtain 24 t DM/ha/year under irrigation (Furoc et al., 1976). Lower yields were obtained in humid tropical Vanuatu in mixed stand of unfertilized para grass-puero (Pueraria phaseoloides) with 2-4 t DM/ha/year. On alkaline soil, yields of para grass were only 6% lower than those obtained on fertile soil (Rao et al., 2010). In India, a comparison between para grass and German grass (Echinochloa polystachya) showed that the latter provided significantly higher yields of DM (5.7 t/ha) and protein (405 kg/ha) (Dhar et al., 2001). Para grass is mainly sown as a permanent pasture for grazing, in wet and flooded areas. It can be grown with other semi-aquatic grasses such as German grass (Echinochloa polystachya) and dal grass (Hymenachne amplexicaulis) but it is generally considered to do better in pure stands (Cameron, 2009; Cook et al., 2005). 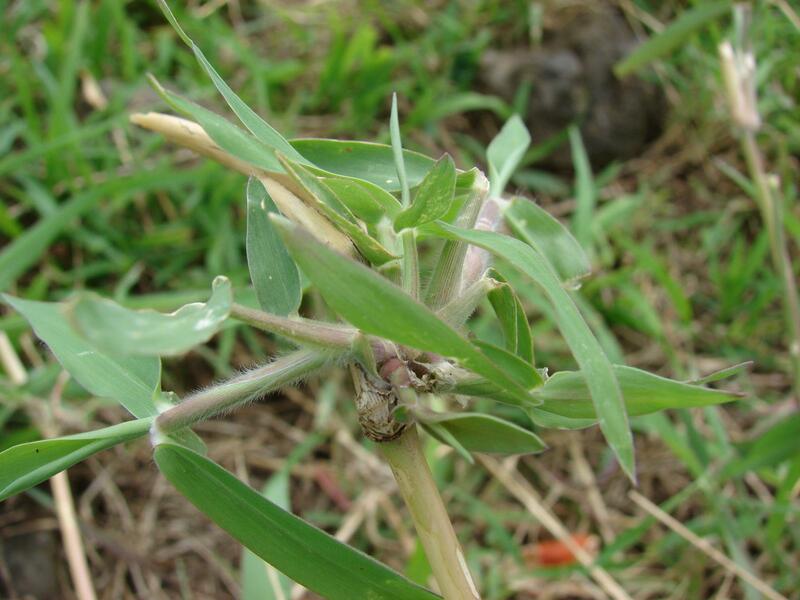 Para grass does well with legumes adapted to moist conditions such as hetero (Desmodium heterophyllum), puero (Pueraria phaseoloides), centro (Centrosema pubescens) or calopo (Calopogonium mucunoides). Cultivation conditions should favour the legume so that para grass does not rapidly outcompete and suppress it (FAO, 2017). In Thailand, a good balance was possible between para grass and centro planted on lateritic red earth soil. Para grass can be sown or vegetatively propagated. However, it is difficult to establish from seeds: they are expensive, dormant, slow to germinate, and small seedlings can be killed by flooding (Cameron, 2009; Cameron et al., 2008). For vegetative propagation, plant cuttings of a length of 25-30 cm with 3-4 nodes should be hand-planted or disc-harrowed to a depth of 10-15 cm with at least 2 nodes buried. Cuttings should be placed at 1 m interval. Para grass requires weeding till not fully established (Cameron et al., 2008). When seeds are used, they can be sown at 1-2 kg/ha in the ashes of a burn or on a well-prepared seed-bed, or directly into wet areas (FAO, 2017; Cameron, 2009). Para grass has vigorous growth: it can spread 5 m in one season and competes vigorously with weeds. However, it is sensitive to heavy grazing. It should not be grazed before the stand reaches 30-70 cm high and should not be grazed below 20 cm so that the growing point is not damaged. It is recommended to avoid early grazings during the first year of growth as it results in the pulling out and destruction of cuttings (Cameron et al., 2008; Cook et al., 2005). It generally takes 12 months for a stand to develop properly (Cameron et al., 2008). After establishment a light to moderate grazing pressure is favourable to regrowth and forage quality, and prevents weed development. Rotational grazing is recommended. Under too high grazing pressure, para grass becomes very open and subject to invading species (Cook et al., 2005). The semi-aquatic habit of para grass is not suitable for mechanical harvesting. However, hay and silage can be made in places where cut-and-carry is common. Para grass makes good silage with only 10% DM losses (FAO, 2017). Para grass is a valuable deferred feed in driers areas where it keeps growing on residual moist places and provides green feed for livestock (FAO, 2017). However, livestock should not enter wet stands as it may damage the stand through trampling (Cameron et al., 2008). Brachiaria mutica, thanks to its adventitious roots, was reported to have a better tolerance to flooding than Brachiaria decumbens, B. brizantha and B. humidicola (Mattos et al., 2005). Flooding has no impact on growth, even during long periods (Haddade et al., 2002). Para grass is particularly adapted for the control of water flow and erosion of river banks (Schultze-Kraft et al., 1992). However, para grass may become an issue in ditches, headlands drains and earth tanks where it may choke water flow, increase sedimentation and cause waterlogging of neighbouring crops as this is the case for sugarcane crops in Australia (Hannan-Jones et al., 2012). Sedimented conditions were also reported to smother benthic species and thus reduce the biodiversity of wetlands (Hannan-Jones et al., 2012). If ungrazed in wetlands of northern Australia, para grass may become a fuel for fires that occur during the dry season. It was reported to represent a much bigger fuel load than native grasses and is thus more likely to burn every dry season (Hannan-Jones et al., 2012). These fires are a threat to natural stands of Melaleuca trees (Cook et al., 2005). As a long-lived, vegetatively propagating pioneering species of disturbed areas, para grass has potential for invasiveness. It is reported to benefit from cultivation, browsing pressure, mutilation and fire (Rojas-Sandoval et al., 2014). It may have deleterious effects on native plant species such as wild rice (Oryza australiensis) whose seeds provide food for indigenous birds. In 1977, para grass was listed as a serious weed in Australia, Fiji and Thailand, as a weed in Sri Lanka, Colombia, Hawaii, Jamaica, Malaysia, Peru, the Philippines, Puerto Rico and Trinidad, and as a common weed in Borneo and Mauritius (Holm, 1977). Para grass, when coupled with a complex of endophytic bacteria (Acinetobacter sp. and Pseudomonas aeruginosa), holds great potential for the remediation of polluted environments, such as crude-oil contaminated soils. It could degrade up to 78% crude oil (Fatima et al., 2016). These results are in accordance with those obtained earlier with the use of para grass to remove organic and inorganic matter from sewage effluets (Ijaz et al., 2015). Para grass could be grown on chromite mine areas, having rapid massive growth in spite of high chromium (Cr) levels. It mainly accumulated Cr in its roots and could be used to reduce the Cr level of the soil (Mohanty et al., 2012). In soils with high salinity levels, such as those of rice irrigated with wasterwater in periurban areas, para grass could help recovering good conditions for rice cultivation while responding to the increasing demand in fodder (Biggs et al., 2009; Mattos et al., 2005). Para grass can be grown under coconut trees, and yielded good DM amounts provided it received adequate N fertilizer (Pandey et al., 2011). Para grass has a variable nutritional value, with a protein content in the 7-10% DM range. Dry and old forage can contain as little as 3-4% protein but protein contents higher than 20% DM have been recorded. In Tamil Nadu, India, a study assessing 16 common forages showed that para grass had the highest content of non-tannin phenolics (2.5% DM) (Bharathidhasan et al., 2013). Para grass (Brachiaria mutica) is widely used in the tropics for feeding ruminants, usually as green chopped forage. It is not suitable for silage. In Northern India (Uttarakhand), a comparative study based on in sacco measurements on 25 feed resources concluded that Brachiaria mutica had a good nutritive value and could be included in the diet of ruminant animals to increase productivity (Sharma et al., 2006).The nutritive value of Para grass is highly variable, due to large differences in composition. OM digestibility values recorded in the literature range from 39 to 77%. In growing goats, the DM and CP digestiblities were 67% and 70% respectively (Nguyen Thi Mui et al., 2001). Daily cut fresh para grass is a forage traditionally used in medium or small rabbit farms in tropical Asian countries including Cambodia (Pok Samkol et al., 2007), Vietnam (Nguyen Thi Kim Dong et al., 2008), Thailand (Kijparkorn et al., 1988), the Philippines (Cortez et al., 1981), and India (Das et al., 2005; Ghosh et al., 2011). Little information is available about its use outside Asia with the exception of one study in Peru (Pinedo Ruiz, 1982). Because para grass is a traditional forage, feeding experiments with rabbits rarely aim to assess its nutritive value but instead tend to assess its replacement with forages such as Psophocarpus scandens or water hyacinth (Eichhornia crassipes) (Nguyen Van Thu et al., 2008; Nguyen Van Thu et al., 2009). Fresh para grass used as a sole feed is not able to support rabbit maintenance (Saikia et al., 2004). For this reason it is employed together with other forages richer in protein, such as water spinach (Ipomoea aquatica) (Nguyen Thi Kim Dong et al., 2006), or more frequently with a concentrate generally offered in limited quantity (Ghosh et al., 2008; Kovitvadhi et al., 2016). The recommended proportion of fresh para grass and concentrate varies widely between experiments, from 20:80 to 80:20 on DM basis, depending on the forage and concentrate characteristics. A proportion of about 25% forage and 75% concentrate seems optimum for growing and reproducing rabbits (Bora et al., 2014; Kovitvadhi et al., 2016). If a balanced concentrate and fresh Brachiaria mutica are both proposed ad libitum to growing rabbits, para grass constitutes about 12% of the total voluntary DM intake, but the forage is of limited benefit since the voluntary intake of concentrate is not significantly increased (+1%) and the growth rate is not significantly reduced (-3%) when compared to the concentrate alone (Keeratikajorn et al., 2012). Therefore, fresh Brachiaria mutica (or hay) should be considered as a potential fibrous forage for rabbits with a relatively low content in protein (10-12%), to be used as a supplement to other raw materials or compound feeds. Holm, L. G., 1977. The world's worst weeds: distribution and biology. East-West Center by the Univ. Press of Hawaii. Technology and engineering. Pinedo Ruiz, W., 1982. Utilization of four grass forage species [Brachiaria mutica, Pennisetum purpureum, Axonopus scoparius, Echinochloa polystachya] in rabbit feeding in the Tropic [Peru]. In: Thesis (Ing. Zootecnia), University National Agraria Selva, Tingo Maria, Peru, 67 pp.